One second after you enter a Target Callsign, Pathfinder consults a built-in prefix table to determine the associated DXCC country. If Pathfinder knows of a web-accessible callbook for this country, it presents a dynamic search button directly beneath the Target Callsign textbox. As illustrated in the Screen Shot [68KB], Pathfinder labels the dynamic search button with the country's DXCC prefix and the letters "CB," an abbreviation for "callbook." Clicking on the dynamic search button or striking the insert key invokes the the country-specific search. Note that some of these country-specific callbooks are databases, some are simple lists of callsigns that you must manually peruse, and some are hybrids. The Australian callbook, for example, is a database whose entries contain the operator's name, rendered as a hyperlink that navigates to the operator's address. Dynamic Search is the automatic selection of a search based on the Target Callsign's DXCC country. This enables Pathfinder to query the 30+ country-specific callsign databases and callsign listings presently accessible via the web. 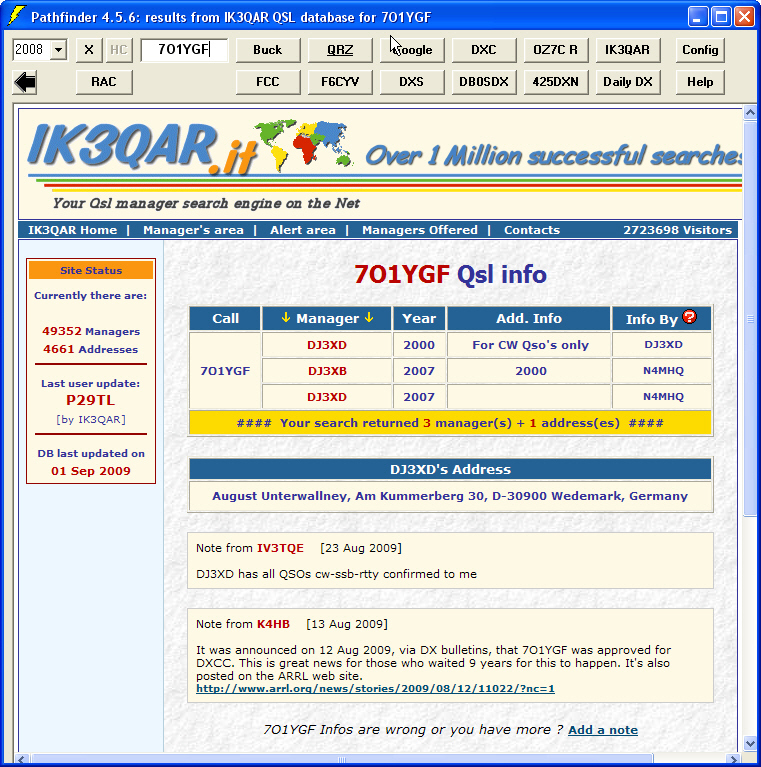 The installation of Pathfinder 3.0 creates a subfolder named Searches within Pathfinder's application folder, and populates this subfolder with several QSL database searches as well as country-specific callbook searches. You can replace Pathfinder's 12 built-in searches with any of these new searches by using the Load button on the Search Modification dialog box; click here for further instructions. New country-specific searches can be added by placing an appropriately named search file into the Pathfinder3 folder. For example, a copy of WM7D.TXT named K.TXT will cause Pathfinder to display the dynamic search button for American callsigns; clicking on the dynamic search button will search the the WM7D data base. You may modify the prefixes.txt file, but should do so carefully; Pathfinder's parser is both intolerant and cryptic. Kudos to Kurt OE1002419 for his contributions to both the general and country-specific search repository. Note that some of the above URLs are unstable - they suddenly become inaccessible and then just as suddenly reappear; as of 10/3/99, both the 9A and OL callbooks are "down". If you notice that one of these has changed in what appears to be a permanent way, please send email to AA6YQ so that the search repository can be updated.